First grade students are expected to understand that the numbers from 11 to 19 are composed of a ten and one, two, three, four, five, six, seven, eight, or nine ones. This activity allows the student time to build this understanding. 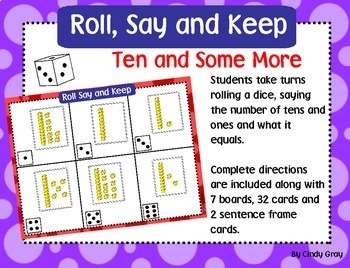 The cards in this activity use base ten blocks to represent the numbers from 10 to 20. The students will use what they know about tens and ones to tell what number is being represented. 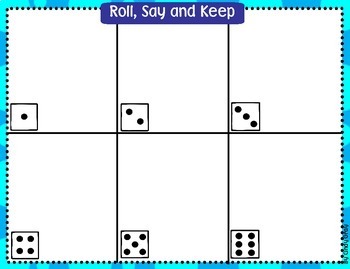 Included in this activity are complete directions, 7 boards, 32 tens and ones cards and 2 sentence frame cards. To make the sentence frame cards, simply cut the card down the middle and fold in half. 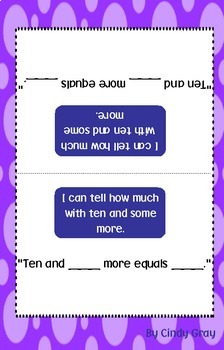 It will then stand on the table to help guide the students in their response to telling how much ten and some more are when combined together. 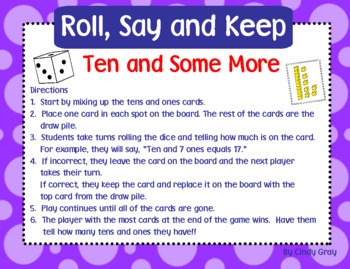 If used, it will help them stay focused and accountable for their learning. Don't forget to follow my store so you'll be notified of new products. As always, I appreciate your feedback and you'll earn valuable TPT credits to use on future purchases.